Orson Welles filmed the sleigh-ride scene for The Magnificent Ambersons (1942) neither in a studio nor on location. He insisted on building his set inside the largest available refrigeration plant. The landscape he required could have been simulated at RKO just as convincingly and much cheaper. What could justify such costly self-indulgence? What gain could it possibly bring to the film? Were Welles’ actors so incompetent that they needed to be frozen stiff before they could bring conviction to a winter scene? There is an answer, and it is visible on the screen. In sub-zero conditions, unlike those on a hot soundstage, the breath of players (and ponies) freezes in the air to a visible vapour. That is an important effect, since it goes with the soft white landscape to make the scene felt as one of natural purity. The sharp freshness of its air, made present this way, provides an all-the-more telling site for the appearance of the horseless carriage. Here, in a scene whose nervous jollity is only touched with foreboding. It is a joke that the vehicle sullies the countryside with racket and filth. But there is nothing frivolous about the contrast between the heavy black fumes of the machine and the silvery human breaths that vanish on the air. It states the vulnerability of the complacent small-town aristocracy to the impact of a new technology. The very breath of an actor can be made significant when the director places it in an expressive relationship with the other aspects of the scene. It can contribute to the effectiveness of the moment – building the sense of a threatened and fleeting purity – and it can establish a visual theme: the Amberson life-style is progressively submerged in an industrial wilderness of smoke, metal, speed and mechanical din. Though the choices are seldom as costly (and only sometimes as rewarding as Welles’ here, directing a film is always about making choices of this kind – hundreds of them every day and at every stage in the translation from script to screen. Many of the choices are matters of craft. The director works to make the scenes vivid and varied, so as to achieve an arresting presentation of the characters and their story. Flaws in the casting may have to be disguised. Dull spots in the writing and sagging passages in the construction of the screenplay may need to be enlivened. Cunning may be required to stretch limited resources: in Letter From an Unknown Woman (1948), Max Ophuls had to construct the living world of late nineteenth century Linz on the back-lot set that Universal had been keeping going as an all-purpose Mittel-Europa exterior since All Quiet on the Western Front (1930). The most promising script, judiciously cast, will still fall flat if the director is unable to get all the elements of the production working together – either in harmony or in lively contrast – so that the end result flows when it is played to an audience. If it does not work on the screen, we are likely to think that there was not much of a story or that the performances were lacking. But often the fault lies in the director’s inability to find a style that brings the material convincingly to life. Just as often, it is the director who should take the credit for our belief that we have seen a credible and forceful story with colourful and engaging characterisation. In terms of the package and its ingredients, there is not much that separates The Reckless Moment (1949), Johnny Guitar (1954) or Written on the Wind (1956) from dozens of mediocre products of the Hollywood machine. The crucial factor is the direction of Max Ophuls, Nicholas Ray and Douglas Sirk. Old Hollywood was well aware how much its product stood to gain, as entertainment, from a style that rendered its drama effectively and made it look, move and sound as if it had a sense of direction. It expected directors to be capable production managers and to complete their work on time, on budget and without major damage to studio morale. But it also valued and rewarded the ability to control performance, image and editing so as to create moods and viewpoints through which the story could persuade and grip the audience. Very seldom would a director’s career suffer from a noisy insistence on getting a particular fabric for the set, a particular lens for the camera or a particular casting for an apparently insignificant role. Directors were paid to believe that every little thing mattered – and to prove it by their results. One minor instance is the choice of props. At the start of Nicholas Ray’s Party Girl (1958), chorus-girl prostitutes are paid for their services at boss Rico Angelo’s party with a gift of powder compacts. The glittering compacts are discarded as soon as they have been emptied of the $100 bills inside. Later Rico settles accounts, at a presentation dinner for his ‘ambitious’ underling, Frankie Gasto, by beating him about he head with a gold-plated miniature pool-cue inscribed ‘From Rico to Frankie’. At the film’s climax, Rico’s threat to disfigure the heroine is teasingly developed as he unpicks the tinsel and tissue wrapping from a bottle of acid. Throughout the picture, then, elaborate gift-wrapping serves as a cover for payments, bribes, assaults, and threats. Ray presents an image of gangland Chicago as a world of disguise whose characters are constantly hiding the true nature of their transactions from themselves as well as from others. The props are one means through which he was able to remodel a fairly routine gangster assignment into a film about pretexts. If objects may be dressed, performers nearly always are. Dress offers the characters’ conscious or unconscious self-presentation and may define social role or financial circumstance. A fur coat provides Max Ophuls with an image for the rewards and limitations of the role of bourgeois housewife in The Reckless Moment. Although the coat is ‘her own’, Mrs Harper (Joan Bennett) cannot dispose of it at a point when she is in desperate need of cash. It is too much part of her uniform, her identity, as the wife of a successful architect. A vital moment is conveyed when she manages to persuade her hitherto rebellious daughter to borrow it: she has at last cast her offspring into the ‘womanly’ role of decorative servitude. The daughter can now be sent out into the world – or to the movies with the ‘boy next door’ – as a replica of her dutiful mother. The same director in Caught (1948), uses three different coats to depict the options open to his indecisive heroine: the extravagant mink of a Long Island hostess; a plastic mac for the poor-but-honest nurse; and a ‘sensible’ cloth coat, warm and becoming but not showy, for the unassumingly loyal doctor’s wife. The use of dress here goes beyond working as a simple but effective visual presentation of changing circumstances. It helps also to define an attitude to those changes. What is important is that none of the garments represents the heroine’s ‘natural’ character. Each of them gives her a role which she will try, or be forced, to live in. Dress is a vital element in deciding how the film will look. But it is only one element, and its design needs to be related to the visual context determined by the choice of locations and the construction of sets. In Some Came Running (1958), the textures and colours of the décor stake out three different worlds in which the hero moves. In the downtown section, the director Vincente Minnelli said, he wanted the audience to feel that it was living inside a juke-box. The design yields a raucous contest between harsh metallic colours. A justly famous scene in La Règle du jeu (The Rules of the Game, 1939) gains much of its effect from Renoir’s use of décor. At the start of a country house party, the aristocratic hostess, Christine, is obliged to confront the gossip surrounding her relationship with a young aviator. André Jurieu. She does this by introducing him to her other guests as a group with a speech in praise of pure friendship. The scene is set in the château’s entrance hall and the décor is a perfectly credible arrangement of doors, pillars and open space. But Renoir’s disposition of his actors and camera turns the space into a theatrical arena as Christine takes André ‘centre stage’ to present him to the others, grouped at a little distance to constitute the audience, while her husband and his friend look on anxiously and at last proudly from ‘the wings’. The sense of Christine’s performance as one governed by strict rules, where a wrong move threatens disaster, emerges from another visual parallel that the décor permits: the camera sees the floor, with Christine and André moving across its black-and-white marble tiles, as a chess-board. The power of the scene largely derives from the tension between Christine’s nervously awkward sincerity and the demand implied by the theatre/chess-game image for the precise execution of a delicate manoeuvre. Physical aspects of production like décor and dress can help the actors to feel themselves into their roles. But the detail of performance that brings the characters to life – movement, gesture, intonation, rhythm – has to be established on the set. Here the director’s job is, particularly, to hold each and every moment of performance within a vision of the scene as a whole so that the impact and effectiveness of today’s scene is not achieved at the expense of what was filmed last week or what remains to be shot. The continuity of the end product is, most often, an impression that has to be constructed and protected in spite of the radically discontinuous method of shooting. (The first day’s work may be on scenes from the final pages of the script, and the leading man may be speaking his lines to an off-screen heroine who is due to join the production in a fortnight’s time.) The pacing of a scene may seem just right in itself, but how will it look when the audience reaches it halfway through the film? Directors work in the knowledge that nothing is right ‘in itself’ but only in relation to the developing design. Balance and proportion are crucial. The task here begins with the casting. The famous Hollywood ‘chemistry’ was usually publicized as an aspect of star teams like Hepburn and Tracy; but it applies to all casting, right down to the smallest roles. When the young fugitives get married in Nicholas Ray’s They Live by Night (1948), the scene exploits, in systematic parody, all the elements of the conventional presentation of a white wedding. The casting of Hawkins, the local justice, whose business is marriage, is clearly crucial. Greed – extortionate greed leaning towards but never quite toppling over into criminality – is what the character must mainly evoke. Conventional casting would therefore suggest a fat man whose figure could represent an unrelentingly capacious appetite. By giving the role against type to scrawny, piping-voiced Ian Wolfe – a starved sparrow rather than a satiated vulture – Ray shades the notion of greed away from indulgent avarice and makes it an anxious habit born of insecurity. The casting of the star parts is a matter on which the director might or might not be consulted. For instance, Max Ophuls did not first agree to direct Letter From an Unknown Woman and then decide that the heroine’s role should be offered to Joan Fontaine. He had to decide whether he wanted to make the film, given that Fontaine was to play the lead. In case of conflict, the producer carries more weight over casting decisions than the director: Ray had to accept Germany’s top star, Curt Jurgens, as a British officer in his World War II film, Bitter Victory (1957). More often than not, the director’s notion of ideal casting for leading parts will be compromised by the constraints of schedule and budget. Once on the set, however, directors have all the freedom that their imagination, tact and persuasiveness can provide. Large statements can be made with small gestures. In the opening scene of Caught, the car-hop heroine is apparently sharing a harmless dream with her flat-mate when she fantasises a chance meeting with a handsome young millionaire. But what is calculating and predatory in this innocence is conveyed by her punctuating her words by making idle passes with a fly-swat while lying open-legged on the bed. What is blind in her calculation, too, emerges from her complete inattention to her own gestures and their evident meanings. Suppose that you were planning the first few minutes of a film whose central issue is to be the uncertainty of emotion, a story of passion dogged by mistrust in which only the strength of feeling (not its nature) remains constant. You want to establish that neither hero nor heroine is sure whether the man’s embrace is protective and loving or threatening, murderous. 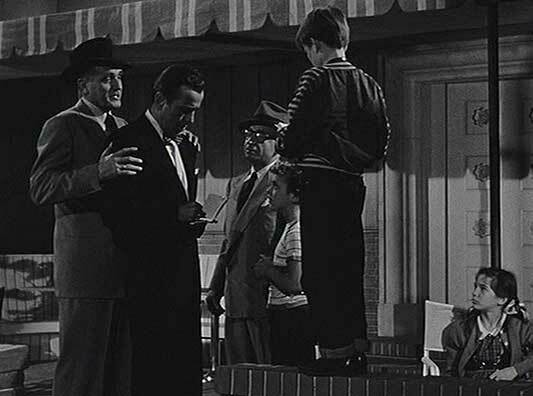 That was Ray’s problem at the start of In a Lonely Place (1950). His answer was to give the same gesture to three different characters within the brief space of the scene that establishes the film’s Hollywood setting: each of them approaches another character from behind and grasps his shoulders with both hands. The first time, it is a perfunctory and patronizing greeting whose pretense of warmth is a bare cover for the assertion of superiority. Then, between the hero and an old friend, it conveys intimacy and genuine regard. Finally, when a large-mouthed producer uses the shoulders of the hero himself as a rostrum from which to publicize his latest triumph, it is seen as oppressive and openly slighting. These moments are significant in their own right, but their deeper purpose is – in a perfectly ordinary context – to dramatise the ambiguity of gesture itself. The work of film direction, as it has so far been considered, is not fundamentally different from that of directing for the stage. But in movies everything is designed to be filtered through the eye of the camera and remade in the patterns created on the cutting bench. Just how far a characterization may result from the director’s control over camera – even when the role is as well cast and expertly played as Judith Anderson’s menacing housekeeper, Mrs Danvers, in Rebecca (1940) – is nicely indicated by Hitchcock’s description of his design. The camera’s frame and the editor’s scissors provide the means whereby the director carves a particular path through the world constructed on the set. Thus at the start of Ray’s rodeo picture, The Lusty Men (1952), we are shown a selection of the displays in the opening-day parade through the centre of a modern Texan town. The camera’s viewpoint constantly encompasses the solid fronts of banks, shops and offices as the permanent background of the passing show. Then, in ordering the succession of images, Ray moves systematically back through time, taking us from tractors and decorated lorries, through covered wagons and mule trains, to a band of fancy-dress Indians war-dancing along the city streets. When we get to the rodeo itself, the film has set it up as a show that attempts to extend the life of images from the past in a drastically transformed present. Selection and sequence are the keys to viewpoint that the director controls. It is a strategic decision, for instance, never to identify members of the rodeo’s audience as individuals but always to view the spectators distantly as an anonymous mass. The place that might be occupied by shots of audience reaction is taken by images of the professionals in the commentary box, and of the harshly impersonal metallic cones of the arena’s loudspeaker system. The audience becomes one large component of a machine whose appetite is spectacle and danger, and which runs without regard for the particular human material it devours. Cutting and camera movement are both means through which direction shifts and manipulates viewpoint. Yet their effects, the kinds of statements they make, are very different. To cut from one object to another is to assert continuity across a chopped-up time and space. Hitchcock does this spectacularly in Strangers on a Train (1951). His montage makes a single sequence out of contrasted events in two towns and on different time-scales: the hero’s battle in a tennis tournament is intercut with the villain’s struggle to regain possession of an incriminating cigarette lighter. To shift the frame via camera movement, on the other hand, is to impose an order of perception on objects which exist in a continuous time and space so that they could, in principle, be seen all at once. The Lusty Men, Ray introduces his rodeo-star hero in a shot which starts with the camera looking in through the gate of a bull-pen. The animal charges along its track to halt at the gate with its eyes glinting in fierce close-up. At this the image tilts upwards to frame Mitchum above the animal, preparing to mount. A direct contrast is drawn between two kinds of strength – the power of a natural force, and the force of human determination. But the camera’s movement links these two images in comparison as well as contrast. For all his apparent mastery, as we look up to him outlined against the sky, Robert Mitchum is like the bull in being contained within the structures of the rodeo: his image, too, is framed, hemmed in, by the wooden posts of the bull-pen. The movement and angle of the shot give a precisely calculated degree of overstatement to the assertion of mastery. Within fifteen seconds Mitchum will be floundering, injured, in the dirt of the arena. His previous inward smile of self-satisfaction at the commentator’s tribute to his prowess, his pose of confident virility as he tightens his belt on the words ‘one of the all-time rodeo greats’ are opened up to irony by the camera’s too hearty endorsement of his supremacy. Ironic overstatement like this is a possibility for the director because the expansiveness of a film style is so much a matter of balance, of what happens when you put together, in a particular way, a posture, a facial expression, an off-screen voice and a camera viewpoint. At the very centre of the director’s job is this task of co-ordination. Direction works with the various talents of highly skilled artists to ensure their contributions meet in a coherent design. The photographer may devise ingenious ways of lighting a confined space so as to give it a sense of room and air. The ingenuity will yield little if the designer has been working to develop an image of claustrophobia. In post-war Hollywood, directors often enjoyed considerable freedom within their assignments – much more than their freedom to choose and develop subjects or to initiate production. So long as they were thought to be making the best possible job of the given package of story, stars and resources, they were likely to meet with little resistance to their ideas about how a film should look, sound and move. But even this freedom has strict limits. Those were still the days of the classic approach which valued formal design only so long as it supported the spectator’s involvement, understanding, pleasure and belief in the narrative. Moreover, quite strict notions of what was appropriate were in play. A brasher, gaudier array of colour was thought suitable for musicals than for, say, light comedy. Melodrama which aimed to carry its audience over the top, with heightened situations and excessive passions, offered a corresponding licence to explore the possibilities of a flamboyant visual rhetoric. Many directors seem to have lived quite happily within these prescriptions, being ready to exert their skills within a range of genres to achieve effective versions of the accepted manner. The limitation of such adaptable know-how was that it would seldom carry a film beyond the qualities of the package originally handed down by the studio. A movie directed by, say, Michael Curtiz would be neither more nor less than the sum of its carefully blended ingredients. Sometimes that was enough. It is no mean praise to say that Casablanca (1942) was as good as its script and cast. But it is probably fair to claim that Curtiz’s best films achieve a dramatically effective manner, rather than a style. The various elements of the film are harnessed only to a reliable judgement of what will make the story work. More is possible. The films of Ophuls, Ray and Sirk, among others, are there to demonstrate how, with no sacrifice of movie-craft, the director can bind the movie together in a design that offers a more personal and detailed conception of the story’s significance, embodying an experience of the world and a viewpoint both considered and felt. At this point, manner becomes style. First published in The Movie, no. 58 (Orbis Publishing, 1981). Reprinted with permission of the author. © V F Perkins 1981. Cannot be reprinted without permission of the author.